The last decade has witnessed the most hostile confrontations between Palestinians and Israelis in their century-long conflict. Most of the recently proposed peace plans have assumed that partitioning the territory of Mandatory Palestine into two separate states would be the ideal solution. Unfortunately, due to sales rights restrictions, we cannot offer One State, Two Peoples for sale in your country. The last decade has witnessed the most hostile confrontations between Palestinians and Israelis in their century-long conflict. 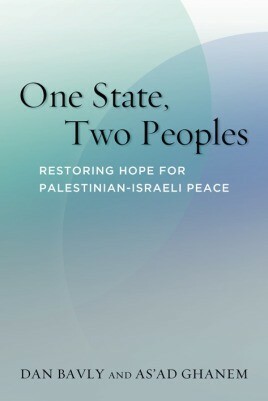 Most of the recently proposed peace plans have assumed that partitioning the territory of Mandatory Palestine into two separate states would be the ideal solution. Given the demographic changes and the established settlements that have taken hold during the past generation, that flawed presumption has led to a stalemate and to despair for both parties. One State, Two Peoples argues that any border drawn to divide the country would be artificial and leave dissatisfied militant elements on both sides. Partition would leave more than a million Palestinians under Israeli sovereignty and citizenship, and hundreds of thousands of Israeli citizens living in the Palestinian territory. On a practical level, common sense asserts that managing water, economic, transportation, communications, and many other issues needs a centralized and highly coordinated approach. Two separate states and administrations would not be able to address these essential matters effectively. Dan Bavly and As'ad Ghanem demonstrate that the only way to break the impasse is to work toward integration with full equality and parity. They fulfill the urgent and essential task of broadening the scope of discussion, proposing new innovative ideas, investigating their feasibility, and presenting them to the public. Dan Bavly graduated from the Hebrew University of Jerusalem after having fought as an infantryman in Israel's War of Independence. The author of a number of books on the history and foreign relations of Israel, Bavly has published articles on political Middle East affairs, on terrorism, and on economic warfare. As'ad Ghanem is a Palestinian political activist and a leading intellectual among the Palestinians in Israel. Ghanem is a professor at the School of Political Sciences, University of Haifa. His theoretical work has explored the legal, institutional, and political conditions in ethnic states. He has designed several policy initiatives and empowerment programs for Palestinians in Israel.